Randomly I get press releases from time to time that may, or may not, be relevant to PolishGalore. I've gotten pitches about the "faulty nature of the TSA" and "how to tip" and while I didn't go Bloggess on them and Wil Wheaten their pitch, it did make me laugh a bit. However, when I got this email about Epsom salt, I giggled at first, but then I actually read it. My family has used Epsom salt in the bathtub for years but only for sore muscles (my dad was a college football star back in the day). I've also used some of it in my son's bath that was scented with lavender to help him sleep. Granted, it kind of backfired on me when he decided to DRINK his bathwater... Epsom salt can help constipation - I'll leave it at that. 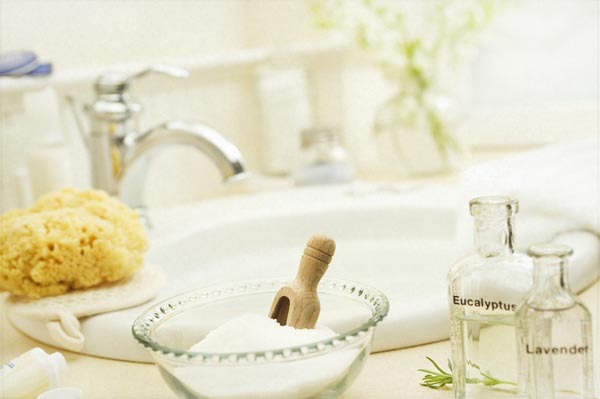 Anyway - here are a few quick down and not-so-dirty (hah) tips on how you can use Epsom salt in your beauty routine. I really want to test out the first one - my face has been crazy this past month. Please enjoy. Some people may remember Epsom salt only as something their grandparents kept in the medicine cabinet, but many experts use Epsom salt to look and feel better (http://www.goop.com/newsletter/33/en), it leaves your skin radiant and glowing and you can find some in your local pharmacy or supermarket for just a few dollars. You can learn more at www.facebook.com/epsomsalt or www.epsomsaltcouncil.org. Microdermabrasion Facial: Mix 1/2 TSP of Epsom Salt into cleansing cream for a deep-pore cleansing. Massage on skin. Rinse with cool water. Pat dry. Bathtime Bliss: Add two cups of Epsom Salt to the water in a standard-sized bathtub; soak for at least 12 minutes, three times weekly. For an extra treat, add a few drops of eucalyptus oil for a refreshing scent. Stress relieving soak: Add two cups of Epsom Salt to the water in a standard-sized bathtub; soak for at least 12 minutes, three times weekly. For an extra treat, add a few drops of eucalyptus oil for a refreshing scent. you know, I really have wanted to try Epsom salts. They've been recommended to me by so many people. I even was told recently that if you use a sprinkle in water, it helps arthritis. I haven't tried it yet, but in Las Vegas, I was really wishing for some to soak my ankle. Great suggestions. I didn't even know you had hurt your ankle until I read that today! Yeah, it does help a lot in relaxing - I don't know how or why but I just know it does, haha! You should be able to find it in most grocery stores... a lot of times it's on the bottom shelf though!